Preserving and making broadly accessible the considerable collection of artifacts from Doug Engelbart's work spanning a 50 year career. How do we create a window into the repository of text, video, audio, slides, etc. for posterity worldwide? An ongoing collaboration to gather, sift through, catalog, index, digitize, upload, tag, and describe archival documents, video footage, photos, and digital files for preservation and broad-based accessibility; and to create meaningful exhibits from selected results. Currently working with 2,000+ digitized photos, 150+ digitized video tapes, plus dozens of digitized papers. This work complements the existing collections at Computer History Museum and Stanford University Libraries Special Collections. 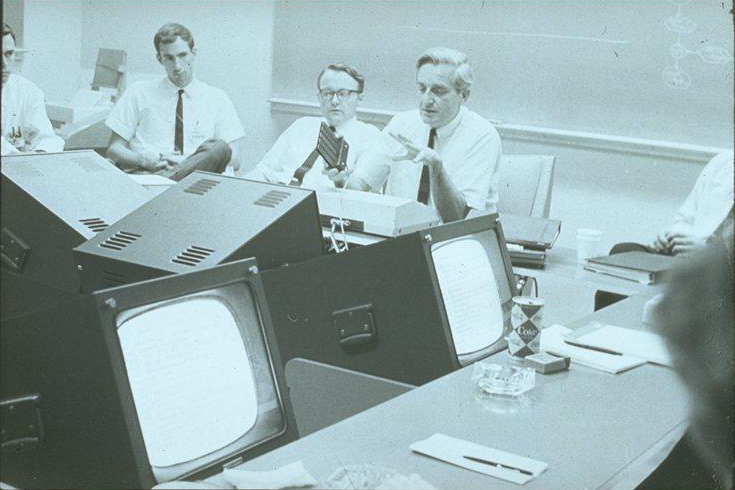 See our Engelbart Archives Special Collections page for more, including links into the extensive online resources already available. How do we create a window into the running software that was the tangible product of Doug's lab and basis for the 1968 and 1969 demos? The NLS/Augment software developed in Doug's lab was designed to facilitate Augmenting the Human Intellect to better address complex, urgent problems collectively. The end system represents decades of co-evolution through rigorous usage by his research team at SRI International as well as by over one hundred customer organizations. This project seeks to maintain a working copy of Augment, which runs on a TOPS-20 operating system emulator running on a Linux-based server, along with several versions of the client software used to access Augment via the internet. This requires securing a suitable operating environment, a network of qualified people to maintain the software, and to support end users exploring the Augment environment. To inform next-generation pursuit of Doug's compelling strategic vision and Call to Action in Doug's own words, through compilations of his recorded lectures, interviews, and meetings, as well as compilations of selected Engelbart texts. How do we get our hands around the vision, call to action, and promising implementation strategies? This project makes more accessible Doug's Driving Vision, through key texts and videos, particularly his Bootstrap "Paradigm Map", for study, extension and implementation. This project includes indexing, tagging, gleaning and highlighting key works from the Engelbart Archive Collection. 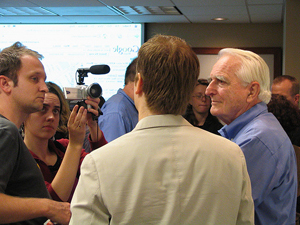 Adding to previous video seminars, we filmed high quality video capture of Doug Engelbart, Jeff Rulifson and Christina Engelbart in discussion during August 2008 at the Stanford Video studio; editing is next – see the Bootstrap Dialogs Projects page for more detail. Learn more at our Bootstrap "Paradigm Map" project page. Bringing forward the underlying framework for information technology to facilitate dramatically increasing collective IQ, innovation, and collaboration. An extension of the Software Preservation Project above, this project will be capturing the full intent, functionality, and unique capabilities of the still working prototypes Hyperscope and Augment in screencast demo format. See our Demos page for existing demos. To create a venue where we can collectively inspire and learn to put Doug's Big Idea to practice, and advance our collective knowledge about what it takes to create brilliant organizations and a brilliant world. A venue for practitioners, developers, researchers, and end-user organizations to inquire, convene, connect, collaborate, and implement. How do we implement Doug's strategies in our own organizations and networks? This project distills Doug's Bootstrap "Paradigm Map" into five actionable organizing principles you can embed in your team, organization or network, develops resources for practitioners such as tool kits, workshops, and a forum for collaboration, and collaborates on case examples of organizations already practicing part or all of the organizing principles. See the New Media Consortium's case example in NMC: Bootstrapping Innovation the Doug Engelbart Way. Learn more at Bootstrapping Innovation and Collective IQ. How do we get started? Learn by doing in real-world hands-on experimental pilot projects. Working with selected pilot project groups. Check out one such project at Virginia Commonwealth University (VCU) Announcing summer MOOC and Engelbart Scholar Award at VCU. See also the Engelbart Challenge. How do we more effectively tap the human potential for working smarter and faster on important problems collectively? This collaborative initiative explores more effective technologies and best practices for cultivating dynamic knowledge ecosystems that enable teams and communities to readily increase their Collective IQ. Special attention given to knowledge processes and to the ease of capture and utility of the group's emerging dynamic knowledge repository (DKR). Which emerging technologies can be cobbled together to enable more substantive engagement, and faster/smarter advancement of shared objectives? Participants 'walk their talk' by using their collective top picks as part of the dynamic knowledge ecosystem they are prototyping to support their collaboration. See also the organizational component to the Engelbart Challenge. How do we inspire the development of tools that facilitate the rapid evolution of Collective IQ? Based on decades of pioneering R&D and deployment of early prototypes, Doug developed a list of baseline requirements for the technology organizations will need to keep increasing their Collective IQ and innovation capacity, most of which are largely unmet in today's information technology. See About an Open Hyperdocument System (OHS) for more on the technology template Doug called for. This project seeks to foster greater awareness and understanding among developers and end-users alike, and to facilitate collaborative implementations. See for example About HyperScope to learn about a demonstration prototype that showcases many of the browsing features called for. See also the technical component to the Engelbart Challenge. How do we engage the collective intelligence of the educational community, and support next-generation scholars, thought leaders, researchers and practitioners? Working with professors, students, and learning institutions and networks to inspire, provide academic resources, create opportunities to participate, and form collaborations such as with Virginia Commonwealth University's new cMOOC and Engelbart Scholar Award program, and internship opportunities. See also our Student Showcase for featured student projects, our University Showcase links to college course(s) that study and/or implement Doug Engelbart's work, as well as our Just for Kids page. See also the student and research component to the Engelbart Challenge. How do we inspire people and organizations to accelerate evolution of their Collective IQ? We are preparing to issue an official call for organizations to begin doubling their Collective IQ. How do we do that? What raises or lowers Collective IQ? Where do we start? How do we measure progress? To include Awards and Special Recognition for Mini Challenge projects and Grand Challenge contenders. For executives, practitioners, tech developers, students and their professors. See case example How these rural initiatives in Uganda are already meeting the Engelbart Challenge Learn more at The Engelbart Challenge. Projects of the Doug Engelbart Institute are aimed at facilitating the advancement of Collective IQ â€“ the collective ability of organizations and societies to effectively address complex, urgent challenges. How do you foster and accelerate innovation within and across organizations? How do you network the stakeholders? How do you capture, catalyze and organize the collective brainpower to optimize innovation? What kinds of tools and practices would help raise your collective effectiveness? How do you keep innovating the above, actively increasing your network's effectiveness, leveraging the collective IQ? What if you could tap in to an innovation network that was focused on innovating innovation networks? C Community and Swimy NIC - joint activities spearheaded by Hirohide Yamada in Japan. "Swimy is a Networked Improvement Community to augment our thought behind our work by exchanging ideas in the spirit of making the world a better place to live." (see our About NICs page) Swimy NIC has been active for about 10 years with about 200 individual members, and derives its name from the fairy tale Swimmy, by Leo Lionni, which describes a collective, cooperative approach to solving large, complex problems. New Media Consortium - the NMC is an international not-for-profit pioneering consortium of learning-focused member organizations dedicated to the exploration and creative application of leading edge technologies and practices. The NMC provides an excellent case example of Doug's organizing principles, see NMC: Bootstrapping Innovation the Doug Engelbart Way. MIT Center for Collective Intelligence, Tom Malone, Director – see especially Measuring Collective Intelligence. yourolivebranch.org - your global social networking site to connect with people and organizations who share the common goal of helping us all become more peaceful and sustainable – visit the Doug Engelbart Institute page there. MIT Media Lab, Hiroshi Ishii, Associate Director – see especially his Tangible Media Lab. DebateGraph - David Price's global debate map (see the Doug Engelbart Institute on DebateGraph); and Jeff Conklin's Dialogue Mapping there. 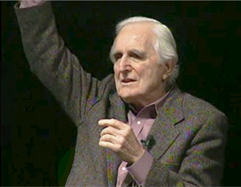 Historic Events - key events featuring Doug Engelbart and/or his seminal work, from his 1968 "Mother of All Demos", to the 2008 40th anniversary celebration "Engelbart and the Dawn of Interactive Computing". HyperScope - developed the initial HyperScope prototype browser through a modest grant from NSF in 2006. Our core team included Eugene Kim, Brad Neuberg, and Jonathan Cheyer, Doug Engelbart, and Christina Engelbart. See about the HyperScope Release Party on our Historic Events page for photos and video, as well as archived meeting records, and the HyperScope2006 project wiki. 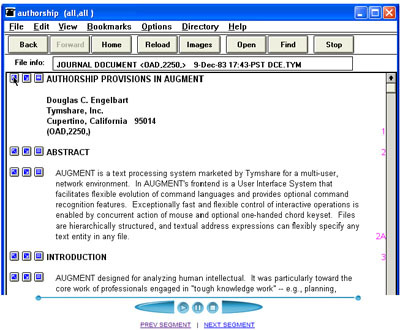 Visual AugTerm (VAT) - developed a modern windows interface to Augment in VisualWorks with funding from ARPA in the mid-1990s, with Bob Czech as the lead software developer. See the VAT pages of the HyperScope wiki for details.